On November 19, 2010, there was a car crash in Kona involving 27-year-old former University of Hawai’i star quarterback Colt Brennan. He was a passenger in an SUV driven by his girlfriend, Shakti Stream, also 27, who crossed the center line on the Queen Ka’ahumanu Highway and hit an oncoming car head on. Stream’s injuries were minor; Brennan’s were more serious but not life-threatening. But the innocent victim, 47-year-old Dr Theresa Wang, ended up in a coma. That happened during my Lonely Planet Big Island trip, so I watched the local news fixate on this story due to Brennan’s football fame. Nevermind that the Hawai’i Warriors were trashed by the Georgia Bulldogs in the 2007 BCS Sugar Bowl, or that Brennan probably won’t make it in the NFL. He was a local hero and will always be. Recently I stumbled upon the We Love Hula Terri blog by Wang’s husband, David Chen. 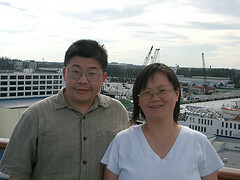 Both immigrated to Alberta, Canada, and then became US citizens before moving to Hawai’i in 2006. She is a physician; he is Director of Finance at the lush Mauna Lani Bay Hotel. I read his January 5, 2011, post, describing the couple’s move to Colorado for specialized spinal-cord-injury rehab, and skimmed his prolific blog archives. One post featured this Honolulu Star Advertiser article that captured Chen’s attitude toward Stream. He struck me as a forgiving, compassionate, optimistic person with a resilient sense of humor. He is a devout Christian, which I admit typically gives me pause, but here his faith is obviously his source of strength. Chen’s attitude reminded me of the yogic teachings beyond asana—and the way we can rise above the average person’s mindset. Could I be civil (let alone nice) to someone who caused unthinkable harm to my loved one for no good reason? Could I blog so openly about a crisis so great? Could I be as “big” a person as he is? “When a man beats you with a stick, you should not entertain any thought of retaliation or any unkind feeling towards the tormentor. Ahimsa is the perfection of forgiveness.” – Swami Sivananda. I wish I believed in God – then there would be a reason for everything in addition to consequences. But even with mere consequences we learn such big lessons from pain, crisis, mistakes, that it is too superficial to treat accidents, their causes, their results as ‘bad’. As people we learn and evolve from hardships, and as yogis we also have a chance to put our practice to the test. I think ‘An eye for an eye’ is one of the deeper imprinted samskaras, easy to deal with by common sense but very hard to fight when it appears as emotion. Could you discover that someone is a devout Christian without it giving you pause? If so, perhaps you’d be well on your way. Apologies. I should’ve known that my throwaway comment would cause misunderstanding. It was flippant, but I am American and in today’s USA, devout Christianity can be linked to the religious right, fundamentalism, and ultra conservatism, which give me pause. I certainly do not write people off because they’re Christian! I guess I needed to spell that out. Jesus and BKS are homies. Colt Brennan should have prayed more before that 2008 Allstate Sugar Bowl. (Edit.) Just ask Tim Tebow. Also, the vandals took the handles. Yes you could! And you are 🙂 I like that you focus in your blog on the big picture beyond asana. Thank you for bringing up my case in your blog. David and I are Christians and proud of it. We both studied yoga (Iyengar) and I did take Dr. Jon-Kabat Zinn’s Mindfulness-based stress reduction course and his teachings have helped me handle the pain. Even now. I would often go in a meditative state to ease my pain (I sustained 22 fractures) rather then take oxycontin or oxycodone. The discipline one learns in yoga will help in so many ways besides tolerating pain or winning a survivor challenge. What a great surprise to hear from you. I’m really glad you found my post. Most people who study yoga, or who meditate, or who follow a spiritual path, are never “tested”–perhaps until the last day of their lives. You were tested and I remain impressed. You are now living on my home island, and I, in Canada. I’m glad to make a connection. Next Next post: Does it matter whether you like your teacher? Or your students?